HaLong Bay lies on Vietnam’s northeastern seacoast, 70 kilometers from Hanoi. A dramatic setting of rocky formations and crystal blue waters, the bay is inscribed on the World Heritage list. It is home to three traditional floating villages that date to the early nineteenth century. These communities are comprised of 400 households, approximately 1,700 people, who live on boats and floating wooden houses in the core zone of HaLong bay. There are some villages in the World Heritage Site: Ba Hang, Cua Van, Vung Vieng and Cong Dam. Among them, Vong Vieng and Cong Dam villages belong to Bai Tu Long Bay in a less touristy area. Each fishing village has about 30 – 50 families with the population of around 200 – 600 people. As most of the rock islands in the area are too poor to be cultivated, daily life in the village is very hard and poor. Their main livelihood is fishing and aquaculture. Traditionally, each boat in the floating village is a separate household, though the raft or boat always serves more than one function. It is a home, a means of transport, and a source of income. The floating village is home to many generations and many of the residents never leave, but grow up and grow old in this unique world where they are born into. Education for children here is an important matter to be concerned. When life is not easy, they need to know how to survive by learning swimming, helping their parents. The children learn to swim before they can walk. Actually, their life will be the same as their parents if nothing changes. One of the most attractive fishing village is Cua Van. 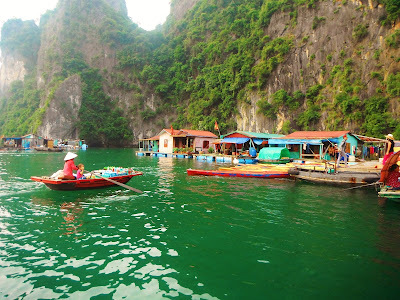 In order to come to Cua Van fishing village (Van Gia fishing village) visitors can take a boat or a cuise from Halong Bay or you can also go from Ben Beo harbour, Cat Ba to visit Lan Ha Bay then visit Cua Van fishing village. 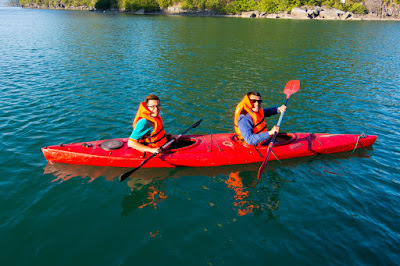 When you come here, you can go kayaking to visit the village, visit children school then you can kayak to visit a Dark cave and Bright cave where you can see alot of colourful coral. If you want to have one tour to explore Lan Ha Bay and the fishing village, you can follow the schedule comes from Beo wharf or Monkey Island Resort (Monkey Island) to visit Lan Ha Bay (Van Boi island, Bai Boi island, Ba Trai Dao area then visit Cua Van fishing village). After lunch on the boat, you will return to visit Viet Hai fishing village in Catba national park. You should choose biking or riding bicycle to visit the village because the scenery was beautiful on the two sides of the road. After visiting Viet Hai village , you can go swimming at the beach on Monkey Island then return to Monkey Island Resort to play and relax at the resort or if not, the boat will take you back to the Ben Beo harbour to come to Catba town center. 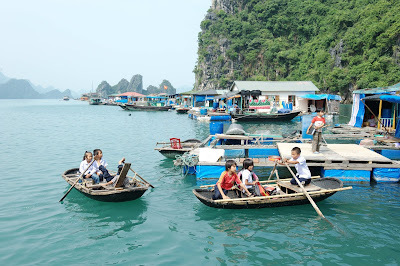 If you are a person who is crazy about exploring about activities on rivers, these floating sites in the South of Vietnam must make you most curious. Let try and have a great joy! When is it better to be in Halong Bay?